Beavers have their pluses and minus’ especially in a river system that is artificially controlled and missing some of mother nature’s rampages. Current Creek is a good example. This is a nice stream flowing from the Unitas south. It enters Current Creek reservoir which is part of the Central Utah Project, our state wide system of water retention and transfer facilities. The dam continuously releases a fairly constant, if not modest, amount of water into the stream while the rest of the water shunts over to Strawberry Reservoir. The beavers love Current Creek. They have built dam and dam in that canyon, creating great willow stands (that the moose in turn love) and wonderful cover for aquatic species to survive and flourish. The fishing on the creek can be wonderful with brown trout in the lower stretches, and cutt’s and rainbows up high. The problem though, is the beavers love the canyon too much. After one dam silts up they just build another. The creek stream bed is slowly being lost as the water flow is spread out over the flat canyon bottom. In some regions of the creek the stream is so braided up it is dam hard to even find what you would consider to be the main channel. What this stream needs, and what the beavers evolved with, was spring flows. And they don’t arrive because of the upstream reservoirs. We are in a yearly dialogue with the Fed’s to create a cleansing spring runoff flow for these types of creeks to flush out the beaver dams (both active and abandoned) allowing the river to regain its channel. And each year it is a big fight to create even the most modest of flows. And, as water becomes more scarce in the years to come, these fights will become even more intense. I am happy the beaver has a real management plan. Maybe we can use this as a base to justify a bit of beaver home wrecking each year. The beavers need a real river as much as us anglers want one. Win, win situation to me. My impression was that beaver habitat ecology was a decades long process of moving from forest stream, to active pond (sans trees), to silted mire, to treeless meadow, and then slowly back to forest with the stream in the same drainage but often on a different path. Can that really happen in most of these areas? The effects of beaver can be quite variable according to the amount of flow variability over the year. I think they do the most of what we regard as good on stream with quite a bit of flow variation over the year. They reduce the peak flows and release the water over the summer and autumn when flows prior to beaver were lower. I can see the dams below a storage reservoir would function differently because the flow is already regulated. Other important factors are the width of the canyon bottom and creek’s gradient. They be very beneficial on cow damaged creeks if there are willow, dogwood, whatever left to build with and to eat. Cattle don’t like their hooves wet and will not stand in the ponds. Erosion gullies often actually make it easier to dam and create a pond. On large streams, the beaver usually don’t build dams, but live in the bank. Now if we can just get Wildlife Services to stop killing them. They eliminated 28,000 beavers in 06. We saw a spike in beaver recovery while we were in Vermont, and for the most part, it was all positive in restoring wetlands environments. And for those dams that caused backups, there are now methods the states or the landowners can use to “breach” the dam in place to allow flow and keep the water levels at acceptable levels. These mostly consist of perforated drainage pipe inserted into the middle of the dam. 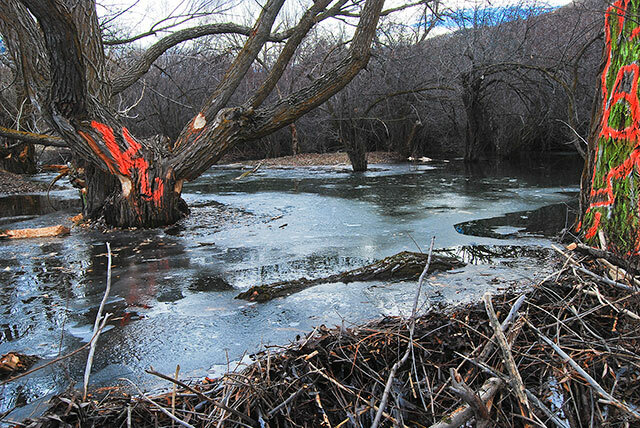 The trick is to not make it appear as if the dam is damaged, or the beavers will repair it. It takes some effort, and some mindset of cooperation, but the benefit is huge, and there, the farmers and other landowners have learned to live with them. Imagine that. It is nice to hear about positive work on behalf of beavers. We lived near a creek at Donner Lake in the Sierras of California for many years and always enjoyed watching the beavers at work. Unfortunately, our dog surprised a mother beaver probably defending her young and was bitten badly. We never repeated that mistake. Dogs and beavers definitely don’t mix. Sadly, right before we moved away, lots were sold along the creek and riprap was installed “to prevent flooding”. I hope at least some of the beavers survived. Ralph, great point about beavers having a big impact on cow-damaged streams. I’ve seen this firsthand and close-up here in north central Az on my favorite fishing stream. The positive effects that beaver can have are amazing! In three years of average to below average precip. beavers improved this stream from a barren rock filled channel to a meandering, flowing stream with much more vegetation, including trees! Unfortunately, during the last two years of the Bush admin., despite a protected Bald Eagle nest in the area, they opened this still drought stricken area to grazing again. The effects were quickly diminished—the cows ate the vegetation around the riparian areas very quickly, since there was little elsewhere. The stream is back to a cycle of low flow and high flood whenever there is significant precipitation, after which it recedes quickly, having little benefit to either humans or the ecosystem. The water flows downstate to support more growth in the metropolitan areas.